The recent success of The Azkals, with their Asian Cup qualification, and their FIFA ranking at its highest at 111, has given football a renewed confidence, and a positive outlook in terms of the growth of the sport in the Philippines. Football is now tipped to become the fastest growing sport in the country, with the largest potential for success commercially, and in terms of on-pitch success. The sport which is currently number 3 in the Philippines in terms of popularity and participation, after basketball and boxing, is said to be still further behind compared to other sports, such as volleyball, billiards, etc., in terms of TV coverage. 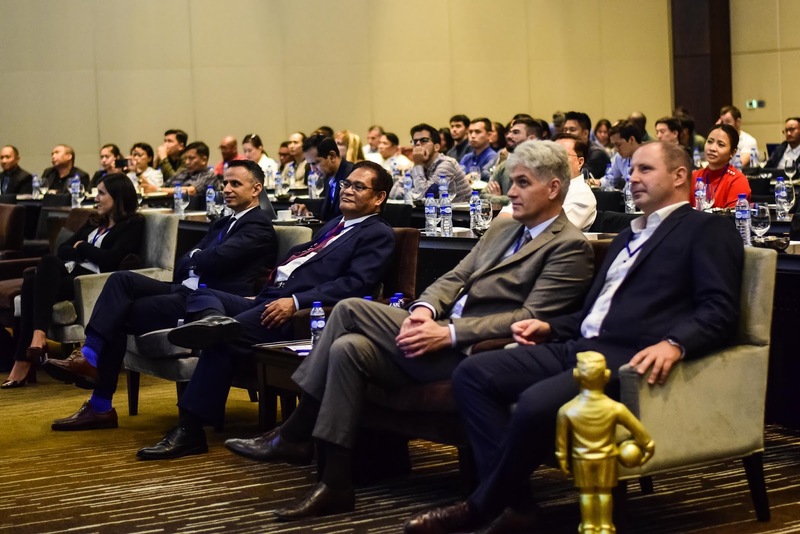 These were among the insights and trends gathered from top-notch executives of organizations such as AFC, PFF, PFL, LaLiga, Dentsu X, SMG Insight, Globe Telecom, RSportz, Toby Sports and Manila Times, at the ‘Business of Football - Philippines’, organized by MMC Sportz. The sold-out event was attended by more than 185 local and foreign delegates on 18 May 2018 at the New World Makati Hotel. “Now is also the perfect time to get involved in football since sponsorship and advertising opportunities are currently very affordable compared for example to basketball, but this is predicted to change within the next 6-12 months, as values are expected to increase sharply. Football also needs to create more idols and heroes to attract more media coverage overall, other than just covering game scores. Each team has a unique story which just needs to be told,” says Gottschalk. Following the presentation about the Philippines Football League (PFL) it was agreed that the PFL now fills the lack of regular created football content as the leagues matches (87 in 2018/19 season) contribute year-round stories to keep football in the news. In the past, the main talking points were around the Azkals which only play very few home matches each year. Public education about the game of football is also needed on all levels as many people in the Philippines are still not aware about the rules or aware of programs available like coaching academies, amateur competitions, or how and where to follow the professional league. Ten thousand (10,000) qualified grassroots coaches are also needed to satisfy the local demand and to trigger strong football development and growths. Investors on the other hand are looking for consistency and credibility of the football product but with the PFL in the second season and foreign sponsors expected to invest in the Philippines, local brands should consider to follow suit. On the sports retail side, only 1.5% of current retail sales are attributed to football, while basketball enjoys a healthy 46% market share. As a result, only limited line items and stocks are available in stores and entry level boots and replica jerseys are too high priced to be affordable for the average consumer. The national player registration program, MY PFF, has been launched with the objective to collect vital statistics and data about the football community which is urgently needed to support the youth football development strategy of the PFF and to develop a players pathway. As FIFA has mandated to register the estimated 1.5 million players in the Philippines, the PFF has urged organizers and players to already register online as by next month only registered players will be allowed to participate in sanctioned events. The “Business of Football – Philippines” conference also announced 36 career opportunities related to sports and football, including positions in marketing, legal, competition management and coaching, with all these listing being available online with MMC Sportz or for direct inquiries with the PFF. In his closing remarks, MMC Sportz CEO Eric M. Gottschalk stated that “More importantly, Don’t Break the 12th Man! It is important that all stakeholders don’t forget to engage with the fans. The fans are the most important aspect of the development of football in the Philippines – if there are no fans of football then there is no media, no spectators, no players, no games, no business. Everyone is required to ensure we keep the fans (football consumers) engaged year-long and the first step would be to get the media behind the game. There is a strong football - community out there already and hopefully, we the TV broadcasters will take another look at football and give them at least some consideration on the program schedule. I believe today’s conference was a great success. We brought the football community together, stimulated thinking, exchanged ideas and transferred a lot of knowledge. Now it is up to the football stakeholders to continue the progress. Speakers who shared their insights include LaLiga Managing Director for South East Asia, Japan, Korean and Australia Ivan Codina, AFC Head of MA Services Domeka Garamendi, SMG Insight Managing Director Frank Saez, Azkals Team Manager Dan Palami, Globe Director for OIC, Citizenship and Advocacy Marketing Miguel Bermundo, PFL CEO Lazarus Xavier, PFF General Secretary Atty. Edwin Gastanes, Ignite Sports Group Managing Director Michael Reyes, Asian Replica Designs Founder & Owner Jonathan Mallinson, Quorum Group President & COO Jose Claudio, Jr., Mediapro Asia Director of Sales and Sponsorship Salauddin Sinnakandu, and MMC Sportz Marketing CEO Eric Gottschalk. Organized by MMC Sportz Asia, the event was sanctioned by the Asia Football Confederation (AFC) and the Philippines Football Federation (PFF), and sponsored by La Liga, Dentsu X, SMG Insight, RSportz, Globe Telecom, Toby’s Sports, Manila Times and Platinumlist.